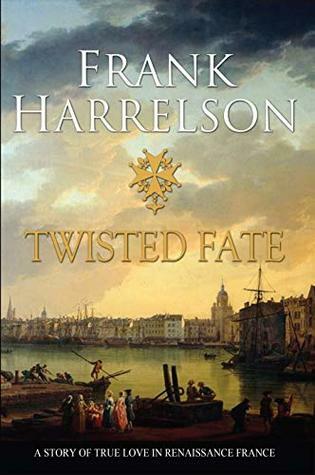 Synopsis: Twisted Fate tells the saga of families in France caught up in the Protestant Reformation begun in the sixteenth century by Martin Luther in Germany and John Calvin in Switzerland. The Reformation caused great conflict between the Catholic Church in France and the Huguenots, who desired religious toleration from the church and from the government. The reader gets involved in the lives of these families filled with political intrigue, murder, suspense, persecution, survival, and ultimately enduring love. I am going to be reviewing this twice over as I stopped reading this part way through then came back to it. To say I was finding this challenging would be misleading - though I have come to a complete stop - such a promising start .. such an interesting topic to tackle ... thinking maybe this could have been tightened up a little or serialised earlier ... on the backburner for now. History is my forte - I love it, and have a huge personal library covering off a number of topics, including French History. So whilst the struggles of the Huguenots attracted me to this work, the final "presentation" detracted form my reading pleasure. Whilst this is essentially a (fictional) history of the beginnings of the author's family and the events that led to their arrival in America, it is also a history of the Huguenot town of La Rochelle. And this is where the conflict begins (no pun intended) - it is part historical fiction and part factual history, with the author attempting to give us the reader, as much information as possible on this period in French history. And, personally, this does not work for me. The lives of the characters (of which there are so many you don't know who to focus on) are drawn out, day by day to the point of tedium, and often scenes are repetitive as characters re-tell what has happened to them to other characters - in detail - after we, the readers, have already read all of this - in detail. The historical facts are detailed, at times, whole chapters dedicated to bringing us up to speed on our French History - it felt like a school lesson. Did I mention the detail? Thus for me, it got to the point that I just had to set this aside, unfinished. But my curiosity finally got the better of me, and I ploughed on - I wanted to find out how this story ended and just which of the characters made it to America and in what circumstances (hint: its in the final chapters). I think, with hindsight, the author should have stuck with either a fictional account OR a factual account; and the editor / publisher should have stepped in here. For an historical novel, it is heavily annotated. Just reading a note I had written down " reads like a genealogy lesson" - and maybe a family tree might have been a more welcome addition or even a list of characters. No, on second thoughts, this should have been a "family history" type book rather than a fictional / factual account, with the historical facts then interspersed, which would have made much more sense. This, for me, became a case where reading became a chore rather than a pleasure.